Did you know that 3 out of 4 car seats are installed improperly? That is a lot of unsafe car seats! Now it seems logical, at least to me, that if you can thoroughly read your car seat’s manual then you can install a car seat properly. However, that is apparently not the case or maybe people just don’t take the time to read the manual. I guess I can see that…put car seat in car, strap in, and go…. ummm no! I’ve said it before but I’ll say it again, you can have the world’s best car seat, you can even have your child properly buckled, but if you do not have that car seat installed in the vehicle properly it isn’t going to keep your child safe. I’m sure we all want our children to be safe while riding in the car (otherwise you wouldn’t be reading this). Here are some tips for getting that car seat properly installed. Please, just read it! I know nobody likes to follow directions and even I many times will toss aside an instruction manual because I can “do it myself” but a car seat is not one product that you want to “figure it out” on your own. Even if you’ve installed dozens of car seats before, each car seat is different. They all have their own quirks and they all tend to be installed just a little bit differently. All children under the age of 13 should ride in the back of the vehicle. This applies to kids whether they are in a car seat or not by the way. As we are talking about car seat installation however, this means that all car seats are to be installed in the back seats of the vehicle. The only exception to this is if there is no back seat (such as in a truck). In which case, a car seat can be installed in the front row but only if the air bag is turned off. It is recommend that children under the age of 2 years ride in rear facing car seats. If you do not like that recommendation, then the law requires rear facing until 1 years and 20 lbs (some states now have a 2 yr old law) but you might want to read my post on extended rear facing before making that call. The LATCH system is provided to make car seat installation easier. 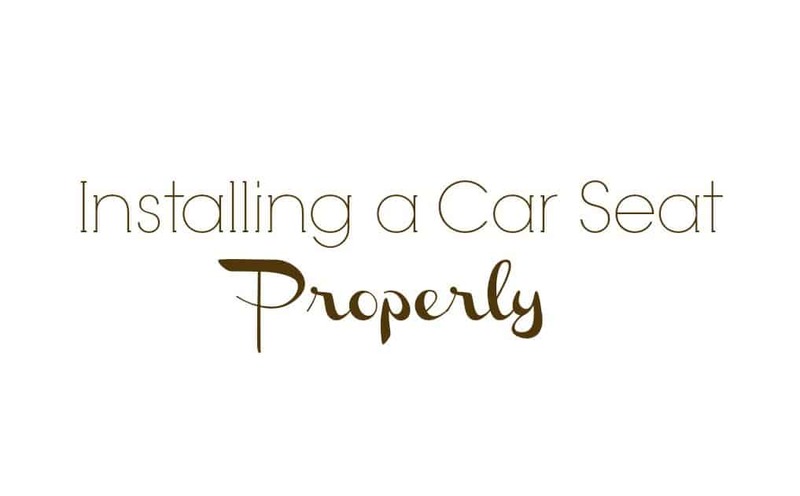 Not all cars are equipped with LATCH and even some that are do not have it for every seat. If your vehicle does have LATCH, use it! Just make sure that you are using it correctly. Some vehicles allow you to “share” LATCH anchors (such as if the side seats have LATCH but the middle seat does not… you could attach two different LATCH buckles to the same LATCH anchor thus installing two car seats next to each other). If your car has LATCH, do not think that you get extra protection by using both the LATCH and the seat belt. It’s one or the other. You cannot use both and it would not make the car seat more secure if you did. If you have an older vehicle chances are that the seat belts do not lock. If they do not lock then you need to use a locking clip. Locking clips are provided with car seats but if you are missing yours then you can easily order one. Locking clips fit on the seat belt a half inch above the buckle and essentially helps “lock” that seat belt in place. For exact details on how to use a locking clip, refer to the car seat’s manual. There are two different slots to thread either the seat belt or LATCH belt through. One slot is for rear facing and one is for forward facing. Make sure you thread in the correct slot for which way the car seat is facing. Even I have messed up on this one. When we passed my older son’s car seat to my daughter, the car seat went from being forward facing to rear facing…but I forgot about the belt slots. Thankfully we noticed this and fixed the problem but it just goes to show that it’s very easy to make a mistake. If the car seat is rear facing then it needs to recline. Rear facing car seats should be installed so that they are at a 30 – 45 degree recline. Thankfully most car seats have a little level device so that you can see when the seat is at the correct angle. Infants with little or no head control need the full 45 degree recline, once the child is older and has good head control you can lessen that recline to 30 or 35 degrees (this may depend on the car seat). This is beneficial to kids as they can see better and it gives you more room between the car seat and the seat in front of it. However, as I said, you can only lessen the degree of recline when the child has good head control. If your car is equipped for this top tether, use it! Also there are a few rear facing car seats that are equipped with top tethers (Britax, Combi, and Diono) if you happen to have one of these brands and the model is equipped with a top tether for rear facing then use it! In order to get a very snug fit, you will usually need to use your body weight to weigh down the car seat and then tighten those belts. Yes, this means you will have your knees or whole body in the car seat. You’ll feel ridiculous and it’s very annoying to do but in order to get a good and proper fit, you need to put your weight on the seat. If you can move the car seat around more than an inch (forward or sideways) then you need to get a better fit. 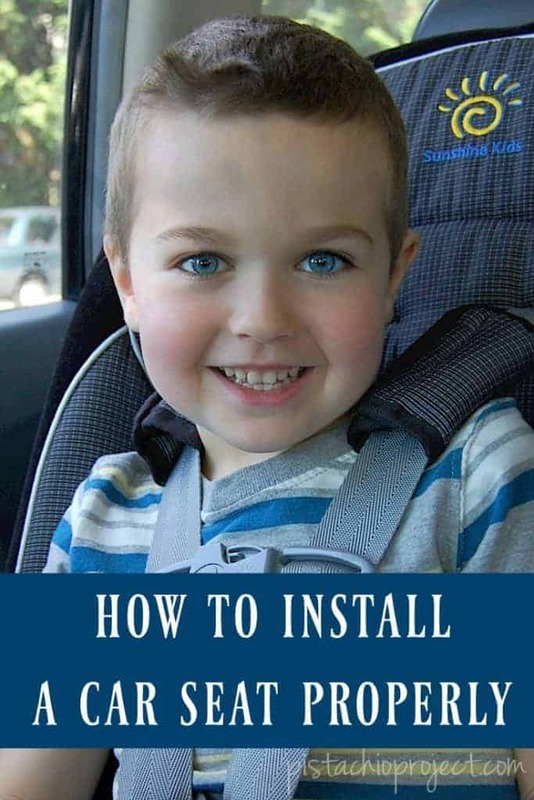 You need to install the car seat so that it cannot move more than an inch. If you feel like you can’t get your car seat installed properly or you just want that extra reassurance that it is installed properly, take your car seat and vehicle to Child Passenger Safety Technician (you can find one here). Usually this is a free service. Need More Car Seat Posts to Read? I had my car seats checked by the fire station, and they specifically said NOT to use one anchor from each of the side seats of the latch system. (My son rides rear-facing in the middle of the back seat.) Maybe other cars are different but the fireman didn't mention anything about different models of cars. He just flat out said NO, that they weren't designed to be used that way. I don't have the latch system in the middle of the back seat so I use the seat belt. As I said, maybe other cars are different but you (anyone) might want to get that point checked out with a car seat tech. Yes Gillian, It's extremely rare for a car to be ok with "sharing" a LATCH in the middle seat. I believe there are a few out there however (although I do not know which). But generally "sharing" a LATCH is not allowed.